Darke County Ohio is not a place that is known for wine production. For that matter, owner/winemaker Russell Rex is not a wine drinker. What matters, it seems, is that his wife Angie is an oenophile. That is what started Russell on his current winemaking path and led to the opening of A.R. Winery near the town of Greenville. Wine names like Lock, Stock & Berry, El Loco Lime and Caramel Apple give some idea of what Russell produces. His lineup, however, includes more than gimmicky fruit wines. There are a few serious grape wines for Angie, but Russell needs to pander to the local palate and there is not a large wine-drinking audience in Darke County. I do not mean to be at all critical of A.R. Winery. Russell Rex has embraced his client base and understands what will draw customers to his doorstep. Seldom have I encountered anyone as enthusiastic about what they are doing. Russell is proud of his wine and he sells everything he makes. For some of the more popular offerings, lines will form at the door on the day of release. Many wineries would be envious of such success. Russell learned to make wine from the Internet. He basically used Google to mine information about winemaking. On the other hand, and he is very rightly proud of this point, he does not use juice. Only fresh fruit finds its way into the wine and most of it is pressed by hand. What Russell and Angie have put together more than a winery. They have the only brick pizza oven in the county and there are plans to start brewing beer in 2018. As a result, they are a local gathering place and draw customers from all over the region. They are definitely filling a niche. It only takes a few minutes with Russell to begin feeling his passion. He has a natural flare for marketing and can really talk up his product. I left a believer and I think you will too. You should stop in and see for yourself. After you do, please let me know what you think. The Bent Tree Winery tasting room does not occupy a "traditional" space, but is located in an industrial park in Mason, Ohio. My GPS had difficulty taking me directly to the winery, but did lead me close enough to complete my navigation using the address the address listed above. Attempts to gather additional information on the winery were unsuccessful and they tasting space was not open at the time of my visit. Be certain to check the website prior to driving out there. Based on the website, it is unclear if Bent Tree grows its own fruit. The wines listed on the site are all cleverly named without reference to grape varieties, so it is difficult to speculate. If you should happen to visit, please share your thoughts. Less than 30 minutes east of Cincinnati and just off Route 32, there is a small brick building that that houses a winery, restaurant and tasting room in addition to the offices for Bardwell Realty. Randy and Gayle Weddle owned the property and were looking to put it to good use. Their love of wine drove them to open Bardwell Winery. By nearly any measure, Bardwell is a small producer. Randy Weddle sources enough juice and concentrate to make between eight and ten cases each week. Since the winery sources juice, it is possible for wine to be made throughout the year or as it is needed. Weddle also makes beer and cider on the premises. Most of the winery patrons are local, but signs on Route 32 do pull in traffic that is passing through. The proximity to Cincinnati is idea and the restaurant is an added feature for attracting guests and marketing the wine. Everything at Bardwell is sold direct to consumer. 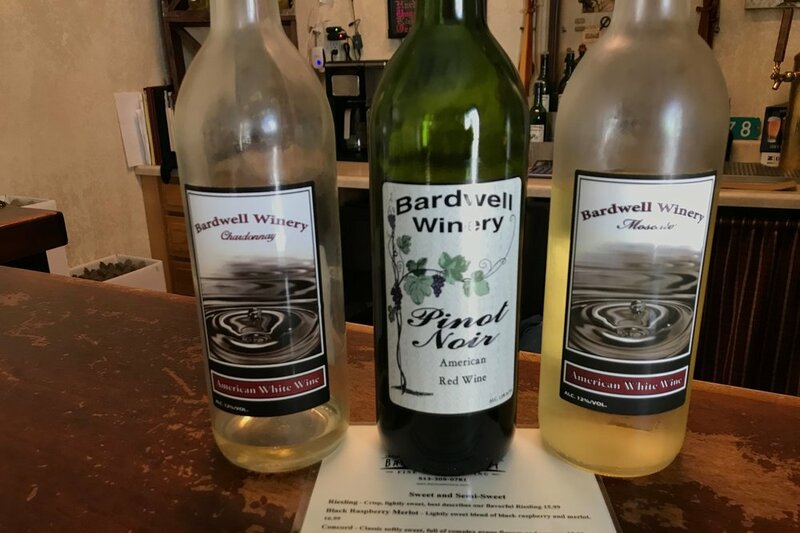 At the end of the day, Bardwell Winery is a family owned operation dedicated to wine lovers throughout Southwestern Ohio. We should lend our support and, when in the area, make an effort to stop in. If you happen to visit, please let me know what you think. Fri-Sat 2 to 7 and by appt. In the post-Revolutionary War era, before it became the seventeenth state in 1803, the area that makes up modern-day Ohio was divided among and governed by the original colonies. Northern Ohio, known then as the Western Reserve, was claimed by Connecticut. Virginia had its own reserve in what is now Southern Ohio and used it to provide land grants to Revolutionary War veterans. I tell you this, because The Virginia Grape feels that it is his manifest destiny, based on historical precedent, to expand his blogging empire into this original Virginia territory. The other reason I provided that background was to give context to another fact. The tract of land, that is currently home to Caesar Creek Vineyards, was deeded by—then Virginia Governor—Thomas Jefferson (which, of course, strengthens The Virginia Grape's claim to Southern Ohio). The original settler’s home was a wooden structure, that no longer exists. It was replaced by a brick home, which still stands on the property, but was not built until well after statehood in 1850. In any case, the property and surrounding area are full of early-American points of interest. Now let’s fast forward a couple hundred years. Walter Borda was planning to open a winery. He looked first in Virginia, but his mother in law offered acreage on her Southwestern Ohio farm. The price was right, it offered good drainage and a southwest aspect, but it also posed a serious challenge. The site is too far north to benefit from the warming influence of the Ohio River. This area east of Dayton is two USDA Cold Hardiness Zones colder than Virginia. International varietals can’t be grown in such climatic conditions. In 2004, Walter began planting cold-hardy hybrids like Frontenac, Foch, Cayuga, Seyval Blanc and Traminette. Despite careful selection, the Polar Vortex of 2013 killed all of the Chardonnel. For the first eight years, while the vines matured, fruit was sold to other local wineries. In 2012, Walter took the next step. He procured a production license and Ceasar Creek began making wines under its own label. To make the wine, a relative newcomer was retained. Trisha Chalfant had an undergraduate degree in chemistry and a graduate degree from Ohio State in horticulture with emphasis on viticulture. With only limited winemaking experience, she was something of a wildcard. Nevertheless, Trisha proved to be a brilliant investment. Today she is making about 1500 cases a year of exclusively estate wine and working magic with the hybrids. I’ve tasted wines made from most of these varietals, but none exhibited the quality I experienced at Caesar Creek. There are several wines of note on the Caesar Creek tasting menu. There was a dry, bright Seyval Blanc: the Cayuga had nice minerality with floral notes and crisp acidity; and the Traminette demonstrated all the best qualities of that grape. In my mind, however, the reds were the most interesting, partly because I was unfamiliar with some of the hybrids. The Caesar’s Red is a big, bold Noiret filled with dark cherry notes and structured tannins. The Frontenac is a medium bodied wine with cherry mid palate and a bit of complexity. All of the wines were exceptionally well crafted and quite surprising. I didn’t expect to discover wines of this quality, made from hybrid grapes in a little-known wine-producing area. Caesar Creek is fairly new and some of the infrastructure is still being developed. The property is quite lovely and has a lot of potential. The tasting room, on the other hand, is functional but small. There are plans to convert the historic settler’s home into a museum and formal tasting room, which will exponentially enhance the experience and make this a more important regional attraction. If visitors can be drawn to this venue and introduced to the wine, it will have repercussions beyond Caesar Creek Vineyards. Southwestern Ohio is producing exceptional wines, it’s just a matter of educating the public. For my part, I was completely blown away by the quality of the offerings and strongly advocate supporting this winery. So make an effort to stop by. You’ve really got to find out for yourself and, when you do, let me know what you think. The only winery in Butler County, Ohio is roughly 30 minutes north of Cincinnati and only a few minutes from the county seat of Hamilton. As the first, owners Eddie and Beth McDonald encountered more than its share of pushback before Hanover Winery opened for business in 2009. Of course, that was in the past. Today Hanover has six acres under vine and the rows are dedicated to hybrids like Seyval Blanc, Marquette, Norton and Traminette. In order to produce the 1600 cases that were recently bottled, additional fruit is sourced from growers in Ohio, New York and California. There are plans to plant more vines and to increase production as early as next year. During my visit, I tasted through several of the Hanover offerings. Although more interested in wines made from Ohio grapes, I tasted a few of the sourced offerings. All of the wines were well crafted and a variety of styles are available. There is something for every palate. My top pick among the “locally-grown” wines was the single-varietal Marquette. This dry-style wine was fruit forward with structured tannins and a very nice finish. Kudos to the winemaker. In addition to grapes, there are a couple other fruits used. Apples and blackberries are purchased from local growers. Of greater interest, however, is the haskap or honeyberry. This member of the honeysuckle family produces a small oval berry that is hailed as ideal for fruit wine. It can achieve sugar levels similar to grapes and contains enough acidity provide balance. Hanover is the first winery I have encountered that uses Haskap and I was more than a little intrigued. I tasted a blackberry/haskap blend. I have to say the haskap influence was transformative. It added a level of balance to what otherwise might have been just a fruit-forward blackberry wine. The tasting room is small, but cozy. A tent is typically erected to accommodate events, but the property provides seating and room to spread out during better weather. The owners have contemplated expanding the space, but for now it is adequate to accommodate traffic. The property and rural Ohio scenery provide an ambiance that makes this an attractive venue. Combined these attributes with the quality of the wine, a visit to Hanover Winery is a no brainer. Let’s make an effort to stop by the tasting room and hope that it’s not Butler County’s last winery. After you visit, please let me know what you think. As you drive down the long drive that leads to Harmony Hill Vineyards and Estate Winery, you might momentarily think you are in the wrong place. What appears to be a residential drive then leads you through the trees and into a little slice of wine country. It definitely has that vibe. An old horse barn was converted into a tasting room. A long, covered patio extends from the front of the structure. On one side there are acres of vines. On the other is small stage for local performers and additional seating in a beautifully landscaped space. Owner/winemaker Bill Skvarla has created the perfect space for relaxing with a glass of wine. Skvarla started planting vines in 2001 with an eye toward selling grapes to local producers. He was a hobby winemaker with no commercial aspirations. After winning an amateur competition, however, things began to change. Harmony Hill was bonded in 2003. Today, the fruit from the 3.5 acres of estate vines is supplemented with west coast grapes to produce about 1200 cases of Harmony Hill wine annually. This is maximum capacity and that is by design. Every task in the winery is performed by hand and crafted to Skvarla’s exact specifications. Skvarla grows a variety of mainstream hybrids; so sourcing from the west coasts allows him to add vinifera (European varietals) to his lineup. It also allows production of more than a dozen wines designed to accommodate a range of palates. When I arrived, Skvarla was behind the tasting bar along with his wife Patti. He stepped me through a few of his estate wines and a couple made from sourced fruit. There were too many for me to cover in this write up, so I will highlight my top picks. The lightly oaked Seyval Blanc was fruit forward, but perfectly balanced with bright acidity in the finish. It was expertly crafted, as are all the wines. The Seyval was my favorite white, but the Chambourcin was my overall favorite. Skvarla allows the fruit to hang as long as possible and the additional ripeness makes the difference. It was a lighter-bodied red, but with nice fruit and none of the astringency that can ruin Chambourcin for many wine drinkers. It is among the best that I have tasted, so kudos to the winemaker. In addition to the quality wine, Harmony Hills is an ideal wine country experience. It is a popular spot for private events with plenty of public events like music and fundraisers for dog or horse rescue. There is also music most Saturdays and picnics are encouraged. The sole caveat is that this is an adults-only venue. The entire experience at Harmony Hills Vineyards is first rate. The Skvarla’s are excellent hosts, who are enthusiastic about every aspect of the winery and take time to educate visitors. The tasting room is easily accessible from Cincinnati and I strongly recommend taking advantage of that proximity. After you stop in, please let me know what you think. Indian Spring Winery was not open when I stopped by. It is important to note that the Winter hours are very limited, so be certain to check the website or call ahead. The sign on the tasting room indicated that the building also houses a farmers market. According to the website, Indian Spring hosts music and other public events. Based on analysis of the website, it appears that the wines are crafted from grapes grown locally, but that is pure speculation. The tasting room is conveniently located just minutes south of Route 32 and about 30 minutes from Cincinnati. If you stop in, please let me know your impression of the winery. I made my way to Ripley, Ohio from Cincinnati following my GPS as it guided me along a series of scenic byways. The small municipality sits on the north bank of the Ohio River in an area that was once one of the largest wine-producing regions in the United States; but that was before prohibition. Today there are a handful of small, boutique wineries in the area. An address on Hamburg Street was the destination plugged into my GPS that morning. The winery is in a one-story residence and I drove past it once before I circled back and noticed a small stone monument that told me I was in the right place. The tasting room does not keep regular hours, so I had called in advance of my visit. As I pulled in to the driveway and parked, Anna Marie Bowers came out to greet me. Once inside, Anna Marie and I spoke at length about the winery. She filled me in on the back-story and brought me up to date on the current operation. Nancy Bently and Ron Barett opened Kinkead Ridge Winery in 2000 producing estate wines from grapes grown on the steep banks overlooking the river just above Ripley. They had experience gained in Oregon, so they were not new to the industry and understood the risks. The couple planted vinifera and hybrids and were perhaps the only vineyard in the Buckeye State to produce Petit Verdot. The winery soon acquired a reputation for fine wine. Their success, unfortunately, was interrupted by the polar vortex of 2013. That weather event decimated the vineyard and the vines were never replanted. After that disastrous winter, the winery went on the market. Don Bowers was an amateur winemaker with bigger aspirations. He liked to experiment and was looking for a larger stage. So in 2015, Don and his wife Anna Marie purchased the winemaking operation at Kinkead Ridge and began sourcing fruit from vineyards all over Ohio as well as New York and California. Despite the fact that the Bowers’ residence was much further north, they continued production just a couple blocks from the Ripley’s main thoroughfare. Today the couple produces about 850 cases of wine annually. Kinkead Ridge is only open by appointment and for special events, so very little of the wine is sold out of the tasting room. They have opted for a strong restaurant and retail presence at numerous locations throughout the state. Anna Marie poured several of the Kinkead Ridge offerings, so I might get a good sense of they types of wines they produce. Among the whites, I tasted their Grüner Veltliner, Catawba and Traminette. I can say that they were uniformly well made and all were perfectly balanced. Catawba was the primary grape used during the golden era of Ohio wine production. When done well, this American varietal makes very good still and sparkling wine. On the nose there were hints of grape jelly that mingled with floral notes and on the palate it was full of fruit, but it balanced well with a nice bit of acidity in the finish. So I really liked the Catawba, but the Grüner Veltliner made my day. The citrus aromas gave way to some minerality, hints of lime and a nice crisp acidity. The Grüner was by far my favorite of the tasting. For reds I was interested in Ohio fruit, so I passed on many of the offerings. I did try the Chambourcin and Anna Marie opened a bottle of the last vintage of Petit Verdot. The Chambourcin was well crafted in a dry style from fruit that was perfectly ripened. It was an excellent example. The Petit Verdot, while not made by the current winemaker, is a very special wine. It saw 18 months in oak and with another 30 months or so in bottle, it was ready to drink. The PV was big and jammy with dark fruit, complexity and a very long finish. It is everything you might hope for in a PV and there are only two cases left. After it is gone, there will probably never be another PV produced from Ohio fruit. My hat is off to Don and Anna Marie Bowers. They took over a very good winery and continued to make it commercially viable. The wines are of a very high quality and the enthusiasm of the owners will carry Kinkead Ridge Winery well into the 21st century. If you are going to be in the Ripley area, give them a call. You might also try to attend their barrel tasting event after Thanksgiving. In any case, you should endeavor to try the wine. If you can manage a visit, please let me know what you think. There is a winery less than 15 minutes from downtown Cincinnati. It also happens to be Ohio’s oldest and largest producer. When I stepped up to the wine bar at Meier’s Wine Cellars, I was informed that they pour sweet wines. This was not necessarily an apology, nor is it something for which they should apologize. It was just a fact. Indeed, there is a large swath of the wine-drinking public that drinks exclusively sweet wines. Despite the large following, there seems to be something of a stigma attached to sweet wine. Compounding these views that are born out of snobbery, the prices of Meier’s wines undoubtedly lend to a perception that the wines are cheap. Coming in at a price point that averages less than ten dollars, Meier’s wines are certainly a good buy. The winery has been around since 1890. Meier’s managed to weather prohibition by producing juice and sacramental wines. So, unlike the majority of American wineries, they did not lose all of there momentum in the mid 20th century. They have a long tradition that dates back to the days of Nicolas Longworth and the heyday of Southern-Ohio wine production. Meier’s no longer grows their own fruit, but sources grapes primarily from Ohio growers and purchases the remainder from other east-coast growers. They do not and have never concentrated on European varietals. Their long experience has taught them to get the most out of native grapes and hybrids. This was brought home to me as I stood at the Meier’s tasting bar and sampled through some of the offerings. Again, there is no need to apologize for the Meier’s wines, because they are uniformly well crafted. 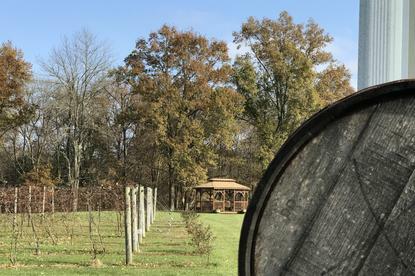 The white Catawba was certainly on the sweeter end of the spectrum, but that is the grape that established Southern Ohio as the first great commercial wine region. Meier’s does a remarkable job with that varietal. There are also drier wines on the menu. The Riesling/Gewürztraminer blend was exceptional. The Brut Niagara sparkler has almost no sugar and displayed complex earthy notes that mingled with the fruit. Other standouts on the menu were the cream Sherry and Port wines. These also happen to be the most popular of the Meier’s offerings. They are made from Niagara and Concord respectively. The concord Port was the biggest surprise. I had to really look for the grape-jelly notes that are emblematic of that grape. At the end of the day, Meier’s Wine Cellars is a producer that deserves our attention. The quality of the wine and the history of this winemaking institution are undeniable reasons to stop in. After you make your visit, I’m very interested in hearing your thoughts. There are a few producers in Southern Ohio that are indisputably wineries of note. Of those there are probably two or three that fall into a more elite category of world-class wineries. Meranda-Nixon Winery certainly falls into the latter grouping. Owner/winegrower Seth Meranda grew up on a farm and went on to graduate from Ohio State with a degree in agriculture. He took advantage of the tobacco buyout and oversaw the transition of part of the family farm to grapes. On the surface this is not an unusual agricultural shift. I have visited dozens of vineyards that have made the move from tobacco to grapes. What is singular about Meranda-Nixon is the quality of the viticultural product. Seth Meranda devoted himself to the vineyard as a grower who understands the science of viticulture and it is obvious in the quality of the wine. Against long odds, Seth is growing vinifera along with some hybrids and American varietals. By vinifera I am referring to some of the standard French grapes like Chardonnay and Cabernet Franc, which are particularly sensitive to cold. As a standard precaution, Seth buries the graft at the end of each growing season. This is a practice used in colder regions. By covering the place where the vine is grafted to the rootstock, it can give the vines some protection against freezing temperatures, but only to a point. There is a story about Meranda-Nixon that approaches the status of legend. During the polar inversion of 2013, when temperatures dropped well below zero, Seth was monitoring the weather while attending a conference in Northern Ohio. When it became apparent that the record lows would be catastrophic for his vinifera, he left immediately and drove home. He and his family worked through the night to bury the vines in the snow. This action saved his vines while vineyards throughout the state were decimated. This is where understanding the science makes a difference. As a result, there was a happy ending for the 15.5 acres of fruit that the Meranda family started planting in 2003. The Cabernet Franc, Chardonnay and Cabernet Sauvignon vines are still thriving along with the Norton, Catawba and Traminette. Significantly, only estate fruit is necessary for the 2500 cases that are produced annually. By the time I arrived, the Meranda’s had been pouring wine in their tasting room for about 10 years. I was just one of many visitors who bellied up to their tasting bar and discovered the quality of the Meranda-Nixon product. Both Seth and his wife Maura were behind the tasting bar and I stayed longer than I should have tasting offerings from the menu as well as a few wines from their library. There were more wines poured than I can mention in this review, but let me give you the highlights. We started with a pair of Chardonnays. The first was a beautifully constructed double-gold winner, lightly oaked and balanced, but it was pedestrian in comparison to the reserve Chardonnay. The reserve was simply off the charts with balance and complexity. Both were excellent and can stand up against similar wines anywhere on the continent. Seth opened a bottle of his sparkling Catawba. This was easily the most interesting wine I tasted simply because Catawba is often dismissed as a serious wine grape. Two centuries ago, when Southwest Ohio was the largest producer of American wine, this was the primary grape. The Meranda-Nixon example had hints of the grape-jelly notes serious oenophiles dislike, but that element was muted on the palate. It is a very nice, fruity sparkler at an excellent price and it represents a bit of history. I thought it was over the top and I took some home. The real story here was the quality of the red wine. They are growing some Norton, which is extremely resilient and does well throughout the Eastern US. The real surprise was the Cabernet Franc and Cabernet Sauvignon. The fact that Seth is successfully growing Cabernet Sauvignon is laudable; that it is an extraordinarily complex wine is almost unbelievable. Then there were the Cab Francs. We tasted a reserve that was another double gold winner. Its rich fruit and firm tannins, combined with the hint of spice and lack of green notes in the finish made it my favorite overall. I was just blown away. There are many things that might draw you out to Meranda-Nixon Winery. One of their wine dinners or the barrel tastings after Thanksgiving might be a draw. You might drop in with the kids, because you heard they are family friendly. You really need to get out there because the wine. All other considerations are secondary. After you do, please let me know what you think.